With down lighting placed sumptuously in this magnolia in Paris, Ontario, we created soft landscape lighting on the paths and steps to ensure safe travel and a beautiful walkway. The challenge with any garden landscape is balancing the softness of nature with the angles of the human design, while at the same time creating a safe, visible pathway that doesn’t interfere with the mood of the environment. The lighting needed to be muted but present, warm without being hot. Moon Glow Lightscapes lit this natural space in Paris with several discreetly placed spotlights. The angle of the lighting illuminates the vivid emerald of the magnolia tree. And even though this lighting draws the eyes upwards, downward pointing lights keep the path lit and safe. This project demonstrates how lighting can create centerpieces in a garden. During the day, this natural space is wide open and beautifully lit by the sun and coolly shaded by the magnolia tree. At night, the lights pull the magnolia tree to the centre of the environment and give the space a sense of coziness and comfort. As with every Moon Glow Lightscapes project, the project team took care to ensure that the lighting is covertly placed into the landscape. Where other companies draw attention to their light fixtures, Moon Glow Lightscapes placed the spotlights into the environment discreetly so that, during the day, the hardware of the lighting is unobtrusive and doesn’t take away from the natural beauty of the space. If you have a project in the works in Paris, landscape lighting from Moon Glow can give you what you want. Contact us today to discuss your lighting needs. In Guelph, Ontario, lives a man who loves to entertain long into the night around the soft, ambient landscape lighting of his pool. But he didn’t always have such a gorgeous spot for spoiling his guests. Before Moon Glow Lighting enhanced the space with luxurious lighting, the spot was dark and gloomy—better suited to a mystery novel or a spot for gargoyles to rest. Lightscaping pools require a special expertise. Water can reflect the lighting in ways that reduces the ambiance of the space, and if the lighting company lights the water harshly from underneath, the client can end up with a pool that is far too public for private swimming. 3) The lighting must accentuate the natural beauty of the water and the greenery. To make this happen, Moon Glow’s landscape lighting design worked with the natural forms of the pool and greenery to create a lightscape that opened up the space and brought out the natural colours and shapes—and did all this without creating the feel of unnatural lighting. If you have an outdoor lighting shortage in Guelph, landscape lighting design from Moon Glow can help complete your outdoor space. The challenge at this Kitchener home was to create landscape lighting that brought people together without spoiling the mood. The result, after much experimentation and consultation with the client, was a lighting design that makes an outdoor space feel like an indoor space. We considered a variety of solutions. One included placing a set of LED lights at the corners of the “room” to provide maximum of light. While attractive, the light overwhelmed the setting. The solution was to post a single spotlight at the vertex where the beams of the open ceiling met. The result is a sense of the light “fanning out” with the lines of the open ceiling. A lack of lighting in the backyard was not an issue because so much light comes from the house. The single light on the ceiling of the open ceiling “closes” off the space without light spilling into the shadows of the dark lawn. Jim said he enjoyed working with Moon Glow Lightscapes because he was initially nervous about how to approach the idea. “I didn’t want to ruin the deck with too many lights. I wanted a simple solution. That’s what I got with Moon Glow,” he says. 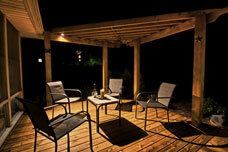 Since the installation of the exterior deck lighting solution, Jim and his family have hosted one dinner party. To discuss your Kitchener landscape lighting project, contact our experts today. With carefully placed landscape lighting at this London, Ontario home, Moon Glow Lightscapes created a space where the barbecue is a part of the backyard, and not an appliance relegated to the corner. It’s a problem most homeowners have encountered: How to keep the back deck looking attractive, clean and well-lit when the barbecue is giving off smoke and getting old? The impulse of some design firms is to hide the old barbecue under a tarp, in the garage or in the shadows. Moon Glow Lightscapes took a different approach for this barbecue-happy family. They used lighting to bring the barbecue corner out of the shadows and into the main area of the deck. At the London house, we used a set of warm, discreet, carefully placed outdoor LED spotlights to light the corner and show off the geometries of the high-end barbecue. And by coordinating the lighting of the barbecue corner with the light design on the rest of the deck and the front of the house, the entire exterior of the house has a uniform neatness. The space feels clean and rich. For garden lighting solutions that can transform your garden, contact us for a consultation today. In Woodstock, Ontario, Moon Glow used artful landscape lighting in the kickplates on the steps of this deck to create a safe transition from the deck to the yard. The pair of doctors who own the home wanted to make the most of the backyard space, especially for those warm summer nights when sitting on the deck is made better with mood lighting. The challenge from a design standpoint was to improve the visibility of the three steps without spoiling the mood. So how did Moon Glow Lightscapes improve the safety quotient of the space without marring the beauty of the night? By weaving the lighting into the design of the deck. The final design of the lightscaping on the deck features a set of neatly orchestrated kick plate lights that illuminate the stairs (for safety) while distributing a soft, warm light (for aesthetics). The lighting works effectively in another way—it lights up the stairs, which have no railings, without unnecessarily drawing the eyes down to the ground. This lightscaping optimizes the balance in the overall design so guests can dwell in the warmly light space without feeling they are in a spotlight. Finally, the ambiance, enhanced by the lightscaping, moves with the seasons. In the warmer months, the subtle lighting captures the mood of cozy summer nights and crisp autumn evenings. In the winter, the durable lighting adds charm to the cool hues of snow and ice so that, even if the deck can’t be used as a dwelling space, it can still function as a well-lit and attractive space outside the window. If you have outdoor lighting ambitions in Woodstock, landscape lighting from Moon Glow can give you what you want. Contact us today to discuss your project.